Could I put a K in the place a big cam used to be without moving motor mounts? What would you have to do about the accessory drive? Could I use the one off the big cam? What about the radiator? Can I get one thats a few cores bigger? What about a aluminum radiator? K has the same "foot print" of a NT, but it is taller. Everything else will be different. You'll nee the K's accessory drive, radiator fan and fan clutch (reverse rotation to a NT) The K uses 2 upper radiator connections IIRC. Check pan clearance on the front axle and tie rod. 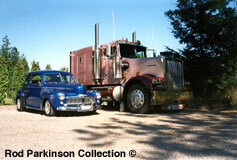 It is also heavier so that may cause problems with weight distribution on the truck. Best to get a donor from the same truck it is going into and strip all the K only parts. The K's I worked on were in equipment and not trucks, Only been around one that was in a Kenworth and never worked on it, it was in a O/O's truck. I may be mistaken about the fan drive being reverse, I do remember something turning opposite on the K. I thought it was the fan drive but may be not. It has been 20 years or so since I worked on one. I drove a new A model KW in 1976 with a KT....if memory serves me right the firewall had a 3 or 4 inch indentation to accommodate the K. The engine bay was cramped to say the least. One photo she's parked in the yard and the other along the Alaska hyway. Dan, you put me to shame, You are alot older than I and have a better memory! For any one that's drove one how does a kt 450 compare to a 444? Or a turned up 400? From what I remember, the KT450 had a tendency to crack pistons, may be they solved it, but when we were building them, we used higher Hp pistons, but left the pump set where it was. 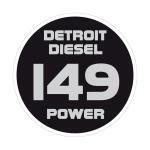 With the bigger displacement the 450 would have more and broader torque then the 444. Fuel consumption was much higher on the K, top was around 4.5 when used in a truck and it went down from there. If I were to build one, it would be to 600hp specs.